To enhance the patient experience, the team at Regional Plastic Surgery Center & Spa, which includes Dr. Denton Watumull, Dr. Bruce Payne, Dr. Joshua A. Lemmon, and Dr. Robert Kwon, recently partnered with Rosemont Media to upgrade the aesthetics and functionality of its practice’s website. With the assistance of our designers, writers, and developers, they have launched an innovative new site featuring modern design elements, an attractive layout, and a convenient adaptable format. Aspiring to create an online destination for patients seeking an informative resource on popular surgical and non-surgical aesthetic enhancement procedures, the site also provides easy access to a broad range of cosmetic and reconstructive content. Chief among the latest upgrades is the responsive website design, which allows visitors on the go to peruse the site from the ease and convenience of their mobile devices. By automatically resizing to fit the dimensions of any screen—including laptops, tablets, and smartphones—current and prospective patients can explore special galleries sorted by individual physician, watch video testimonials, and read blog posts without having to pan and zoom to view the entire page. To further appeal to visitors, the Dallas plastic surgeons incorporated images of real patients into the design to add a more personal touch and reveal the potential outcome of their treatments. As advocates of exceptional patient care, Drs. Watumull, Payne, Lemmon, and Kwon strive to provide the best experience possible. To aid in this endeavor, they are utilizing the latest medical SEO strategies to increase the site’s visibility in its online marketplace, helping visitors more easily source desired information. They believe by educating potential patients, they can assist them in making well-informed decisions that can lead to more satisfying results. 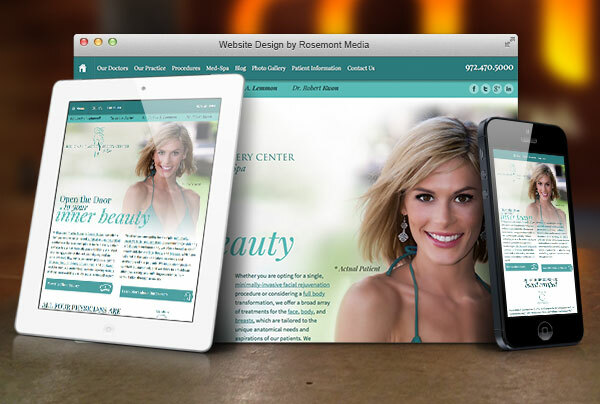 To view an example of one of Rosemont Media’s customized responsive website designs, please visit www.create-beauty.com.